Here’s another great example of how much our young students look up to our athletes. After reading the book The Mitten, students were asked to draw something to fit inside of their mitten. They were prompted to try and think of something that’s actually much larger than a mitten, just like in the book. 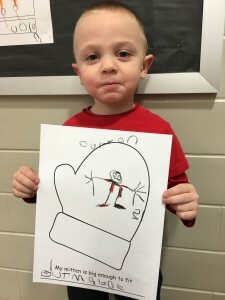 Preschooler Colton Roll chose to draw 6’9 Southport Cardinal Basketball player, Dut Mabok, inside of a mitten. As Colton stated while he drew, “he’s a really big basketball player.” Thanks to Dut and all the other athletes for being someone our young students can look up to.